Aside from a little spiff-up at Chez Métier, my body also continues its quest for self-improvement. Of course, when I think of it, none of this would have been possible without my caretaker’s hands. These hands support me as I sit or stand. These hands cook and clean for me. These hands change the dressing on my incision. These hands comfort and reassure when I get a little whiny about this or that. I know I jokingly referred to my mother as “The Warden” (and she can be a tough taskmaster at times) but I know full well that every admonition is meant for my own good. Except for that little misunderstanding about the knitting ban, but we’ve worked that out. I’ve actually knit half a mitten since Saturday. I know that’s a snail’s pace so just be quiet, OK? Once again, I am the lucky recipient of a beautiful get-well bouquet. This time, however, I know from whence they came. Too bad the smell-o-vision plug-in is on the fritz because these are a delight for the senses, with the rich perfume of the red roses in nose-to-nose competition with the sweet notes of the bluebells for my olfactory attention. Rocky in his “What? I’m not doing anything” pose. Seconds later, Rocky is so busted as he is spotted sampling the rose petals. Continue the mend, enjoy the holidays, and find some time for happiness. Glad you are finding some relief from pain. It’s good to see you are improving, eventhough it goes slowly. Bless your mother for being there for you, and bless your kitties for bringing joy. I hope you can enjoy Christmas and wish you happy Holidays! really. hands are just one of the most important things. the love that is passed from one to the other with just a touch. amazing, really. Beautiful photo of your mother’s hands. A wonderful sweet photo. one to frame. About eating roses not being our mode of appreciation? I’m wrong: a blog all about flower-flavored food . . .
and a recipe for rose-flavored candy . . . Such lovely images, furry & floral & precious hands. Kittycats appreciate the good things, too – though eating them isn’t exactly our mode of appreciation! :o) lol! Hope it’s all going really well! And Mom’s make the BEST caregivers – not to worry, the day will come when you return the favor (most of us must!) – tho’ for everyone’s sake I hope not too soon! Gorgeous flowers…and oh, yes, my crew loves them, too! Take good care of yourself – 1/2 a mitten is terrific! Rocky looks like he’s on the African Sierra stalking some prey. Lovely flowers and gentle hands. I *love* the picture of your mom’s hands. How lucky you are to have her there to take care of you. 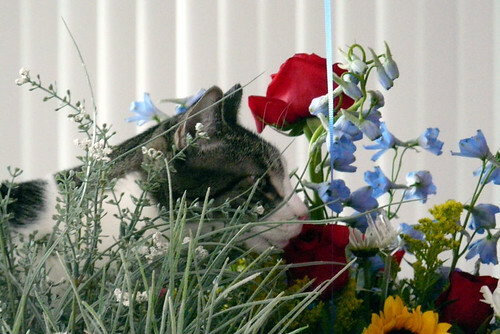 Of course kitties love flowers! My cats eat the flowers, especially baby’s breath. I think they’re weird. All cats are weird. Those are lovely and how nice that they smell good. So often the smell is bred out of them in favor of long stems and long lasting blooms. I love the smell of roses. I have been so out of it for various reasons the last couple of months, that I missed wishing you well with your surgery. 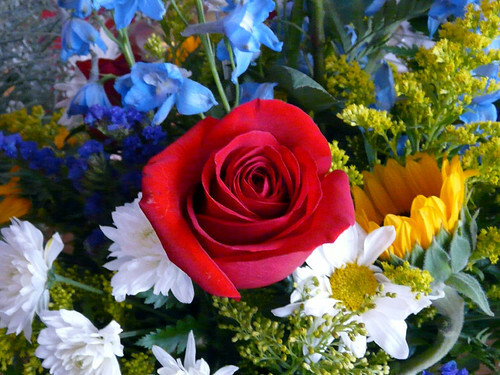 I am glad you are recovering well and receiving so many wonderful flowers. I hope Rocky keeps his nose out of them! Best wishes for continued healing and joyful holidays! Oh Rocky! I knew you’d go after the roses! I have a weird tidbit. I actually knew a girl who used to eat the roses her then fiancee sent her. Ick. I hope you and your mom don’t come to loggerheads — sounds like you won’t since you appreciate her intentions. You’re lucky to have her! Such beautiful flowers and photos of Rocky! Hope you are feeling better and able to knit more soon. 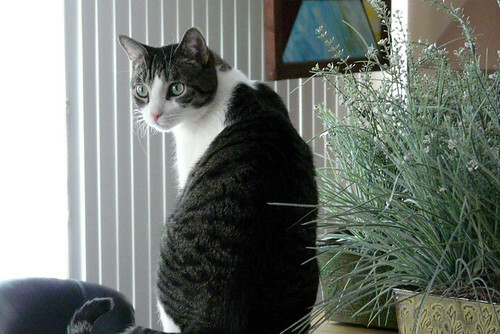 I have read that cats really do smell flowers for pleasure. Maybe Rocky just feels if it smells good it must taste good. You have done very well on the flowers. Good going on getting some knitting done. what a beautiful tribute to your mom. i know what you mean, but what would you do without her. i hope you’re well with your recovery. Beautiful flowers! Hope the recuperating is going well! Awwww. Lovely flowers! And lovely kitty too, even despite the guilty look on his whiskers. Glad to hear that you’re recuperating – take it easy on yourself, that’s a lot of knitting, lady!